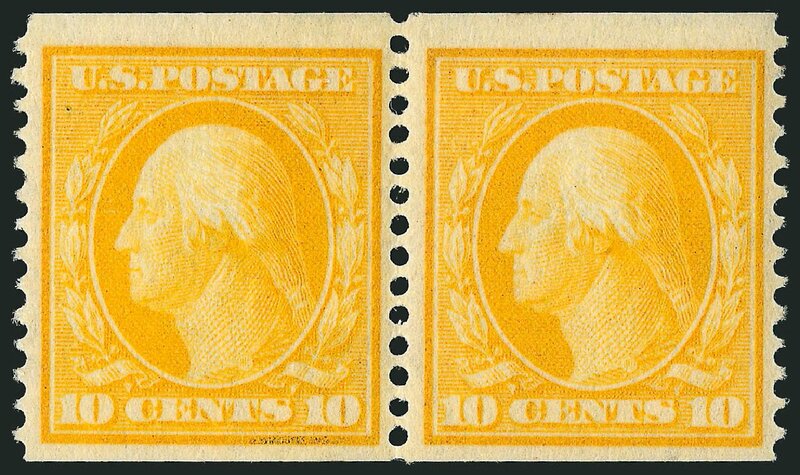 USA (Scott 356) 1909 WASHINGTON COIL 10¢ YELLOW, LINE PAIR A RARE guide line pair. Missing from even advanced collections. OG, previously hinged, fine to very fine. (2005 PF Cert #432955 & 1988 PF Cert) Cat $16000. 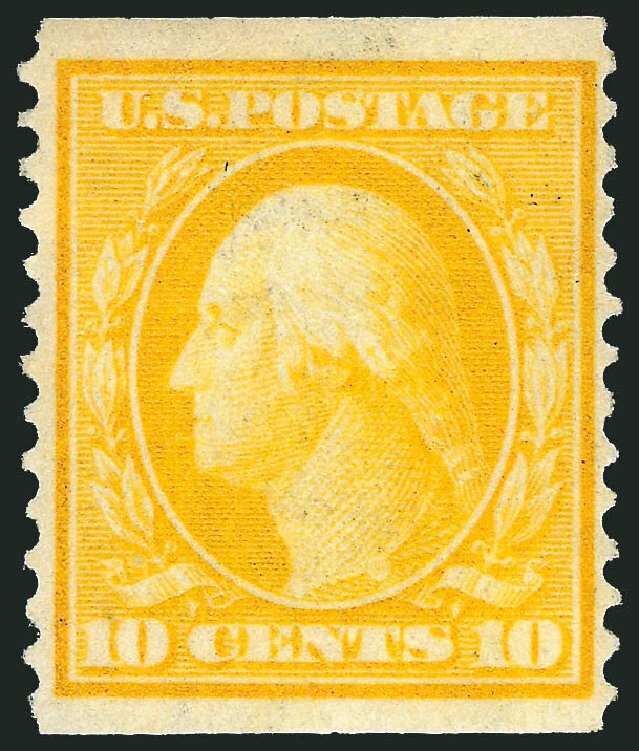 1909, 10¢ yellow coil. 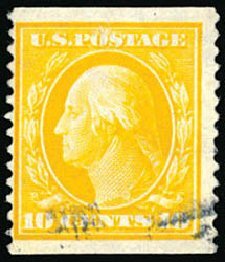 Bright color, light face free cancel; some light creasing, a Fine appearing used single of this coil rarity. Scott No. 356; $4,500. 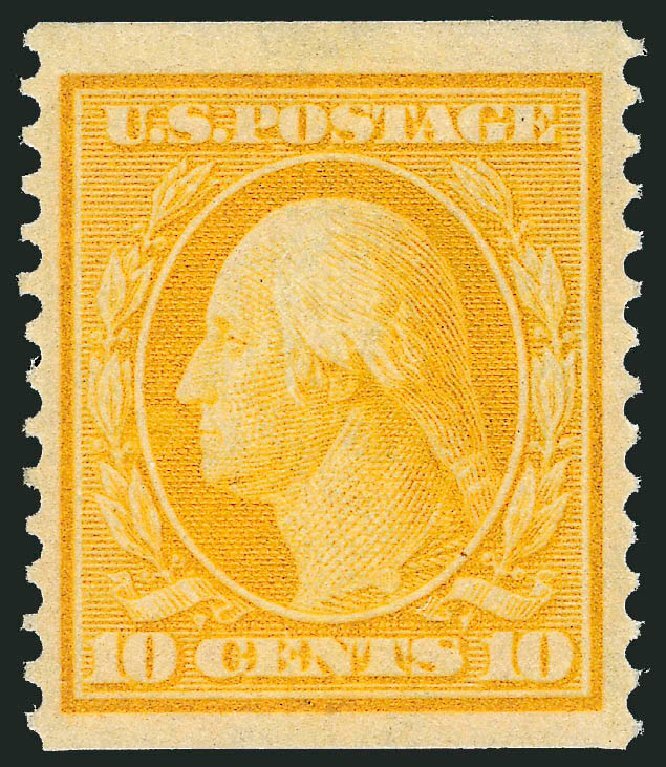 1909, 10¢ yellow coil. 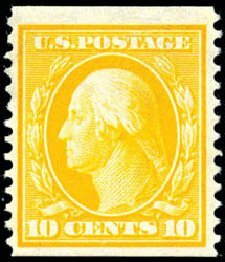 Light town cancel, rich bright color; tiny light corner crease at bottom right, otherwise Fine, still and attractive used example of this Washington Franklin coil rarity, with 2011 W. Weiss certificate. Scott No. 356; $4,500. 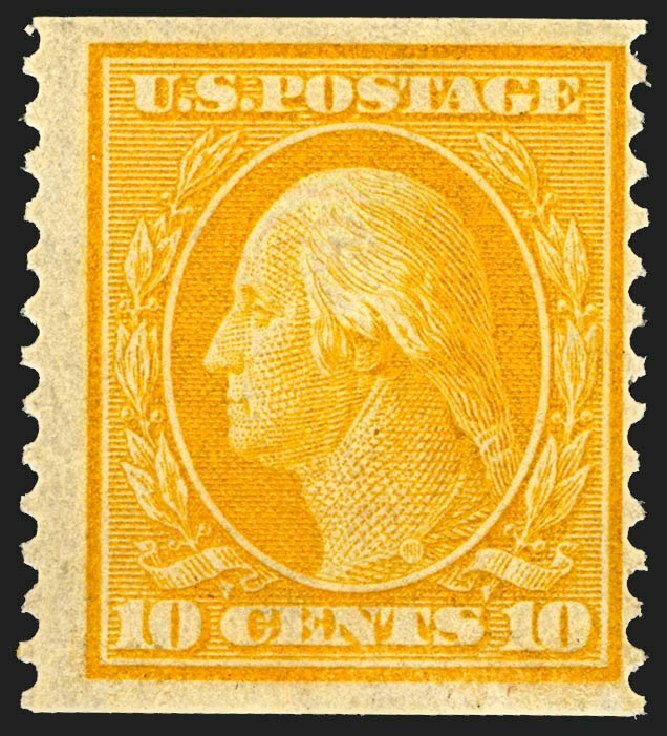 1909, 10¢ yellow coil. 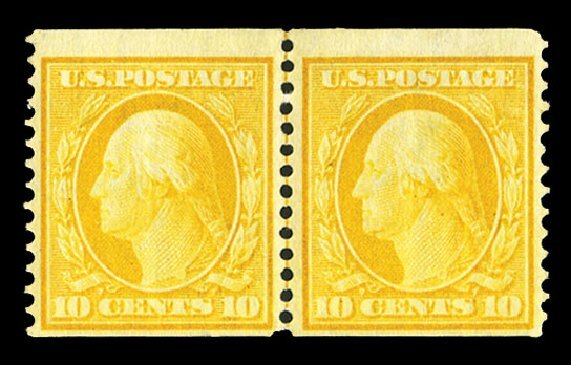 O.g., very lightly hinged, rich brilliant color, exceptionally bright, fresh and F.-V.F., an attractive example of this scarce 1909 coil issue, with 1998 P.F. certificate. Scott No. 356; $3,500. 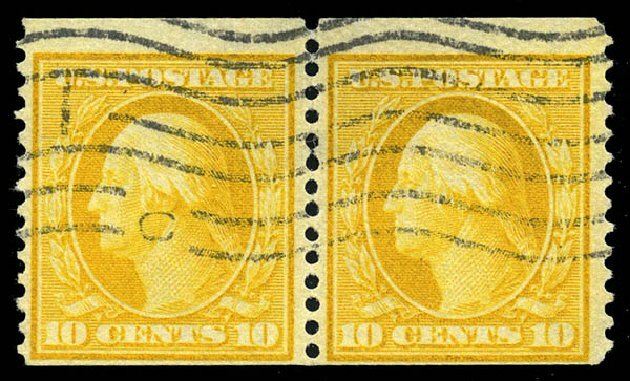 o 1909, 10¢ yellow coil (356), pair, nicely centered, rich color. Neat machine cancel. Single perf separation at top. Fine. 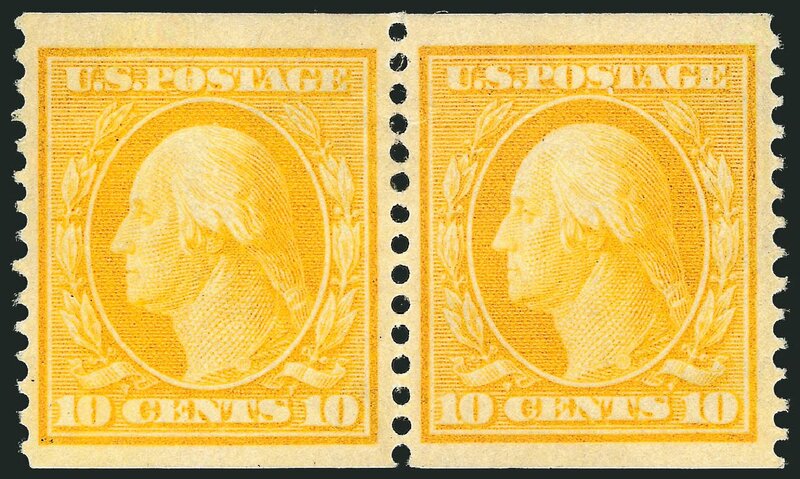 Scott value $10,500 AN ATTRACTIVEELY CENTERED AND SOUND EXAMPLE OF THIS RARE USED COIL PAIR, OF WHICH LESS THAN 20 HAVE BEEN CERTIFIED BY THE PHILATELIC FOUNDATION WITH APPARENTLY NO GENUINE USED LINE PAIRS. Expertization: 2001 P.F. Certificate. Provenance: Twigg-Smith. 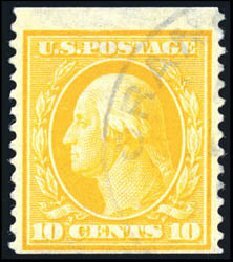 10c Yellow, Coil (Scott 356). 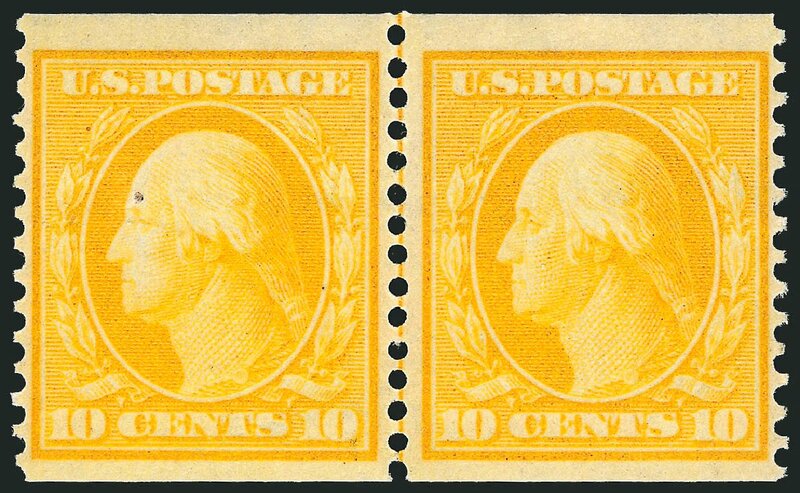 Pair, spectacular color, attractive margins and centering, accompanying P.S.E. 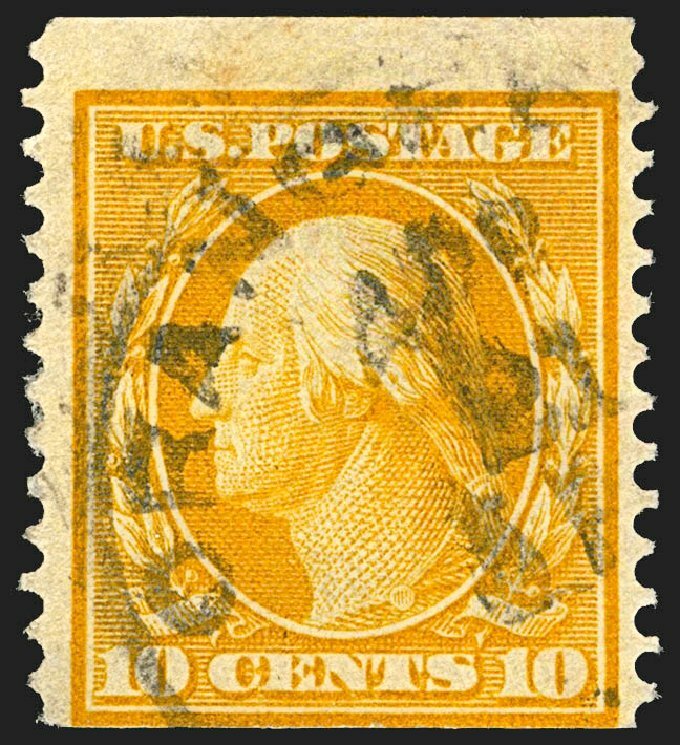 certificate mentions a tiny scuff in the bottom right margin of the right stamp, it is all but invisible and not mentioned on two P.F. 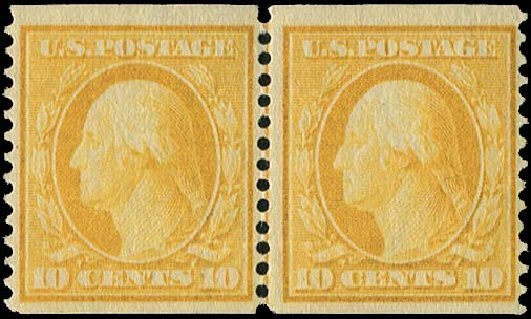 certificates FINE-VERY FINE PAIR OF THE 1909 10-CENT HORIZONTAL COIL, SCOTT 356. With clear 1988 and 2008 P.F. certificates (F-VF 75). With 2007 P.S.E. certificate mentioning a tiny scuff (OGph, F-VF 75, SMQ $4,650.00).